Firstly I would like to thank and congratulate everyone that took part, my expectations have been exceeded with more postings than I expected on this difficult challenge / experiment. Before making the top 3 selection I will comment on some of the images, and this is not because they are better or worse than the others but merely that I felt I wanted to say something and it perhaps makes the judging more interesting. I claim no expertise or that I have a better opinion than anyone else. As always, what you feel about your own images is absolutely more important than anything I’ve got to say. I would also point out that this subject is perhaps a little more subjective than usual! grandmaR – thank you, for as usual you lead the charge when it comes to contributing to any challenge. It was a relief to get first posting. The descriptions behind your photos are sad indeed and I like the idea of your before and after shots. A few years ago on a road trip I broke the journey to visit one of my old schools and for me it was an emotional mistake. I totally understand how you feel. 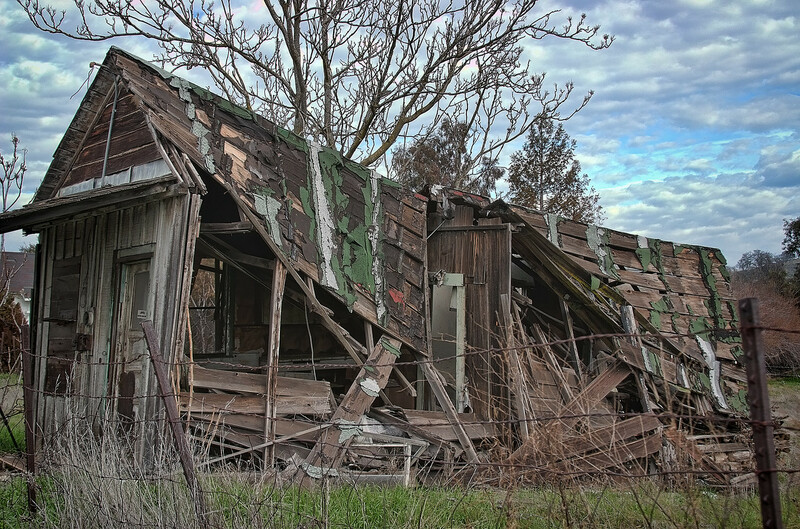 Peter – I really appreciated your “Dumped instead of recycled” and the “After the storm” photo. It’s always distressing to see so many trees destroyed and personally engaging for me because I had 6 fall into our property last year including one that hit the house – it was a very large and distressing insurance claim. Paul – I consider all three of your photos to be really very strong. My apologies to all, but I feel compelled to take more than a moment to comment on the Dead Fox image. I’m sure everyone will have different feelings about this image and I have acquaintances that might actually be happy to see this. For me it is shocking, powerful and does convey a strong message about urban / human impact on wildlife. In addition, and I could be totally wrong, technically this has the feel of a well-crafted shot of a difficult subject. Perhaps it is just a “snap”, but I doubt it given the angle, the perfect framing of the fox by the background car which is suitably blurred or motioned blurred. I suspect it was very much a well-considered take. It is of course possible it is a composite, but again I doubt it and in this case wouldn’t care anyway. At competitions I often hear judges say – “What has the photographer added”, i.e. more than just simply recording something that was there, and anyone can press the shutter. In this case I would say Paul has “added” a lot and although unpleasant to look at, I seriously applaud him for this shot. That said, I must now apologise to Paul and anyone else who tripped over my possibly poor challenge definition - “Distressing Places and Spaces”. However I did say “It’s all about negative environments” and I feel this image has drifted slightly too far to the fringes of the concept of being about “Places and Spaces” to be put in the top 3. Nevertheless, I am delighted it provided an opportunity to share it with us, and once again I applaud you. Your “Plastic bag, Sir?” is also a strong contender. Jo – I really like the colour pop on your “Left-overs in central California” and enjoyed your other two as well. It’s very slight shame I can see what looks like a modern building on the left of the Murphy house. I generally don’t Photoshop, but might be tempted on this one if I had the skill. 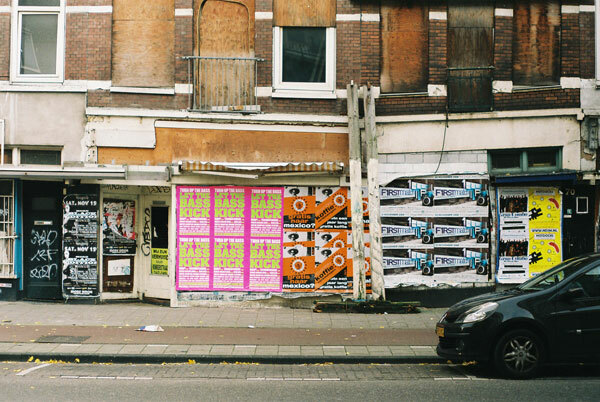 Jeroen – I liked your shots, particularly No 2 with its poster covered downstairs shops and boarded windows upstairs. All the odd angles on windows etc on the sagging and “propped up” (?) property add to the interest. I would have liked to have seen a bigger version of this image so I could confirm my understanding of what’s going on here, hopefully I’ve got it right? A title would also have assisted in this aspect. For me, the shiny newish car in the frame doesn’t really add to it as it’s not a strong enough element to create juxtaposition and feels a little intrusive into the frame, but I appreciate it was just in the way. Thelensspot – I really like the furniture plant image and love the high contrast processing you have done on it – great shot. I also like the paper mill and totally accept your comment that the bird was not added. However since you mentioned it, and I admit it’s is late here as I type this, but to my eyes the sky looks slightly darker around the bird and it appears to have a 1 pixel halo all the way round (admittedly magnifying glass needed) so perhaps that is creating an impression it may have been added. I don't think its a serious issue but I do think something is going on here which makes the bird look just very slightly detached from the overall image. I am probably totally wrong but I’m wondering if you have done some localised contrast, sharpening or clarity adjust and perhaps pushed it just a little too far. It reminds me of the kind of artefacts earlier versions of Lightroom (V3, process version 2010 and earlier) could create with the clarity tool. My apologies if I’m wrong and sincerely sorry if I cause offence. I’m not trying to be critical here and it’s because I like the shot that encourages me to comment. I’d be interested to know your thoughts. 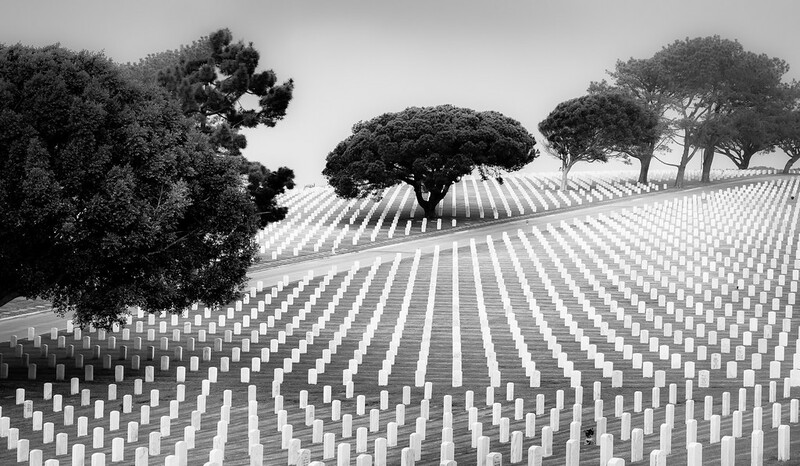 For me this is a powerful scene of Fort Rosecrans National Cemetery and I know if I was there I would be quite moved. I really like the ethereal feel you’ve created in this image - a mild infrared treatment perhaps? What I also appreciate is the way the horizon blends into the sky and creates an infinity feel and also that on first glance it appears that sadly only one grave has flowers on it – although there are actually others. OK, enough rambling from me, it’s time to agonise about the top places – it’s been a tough call. 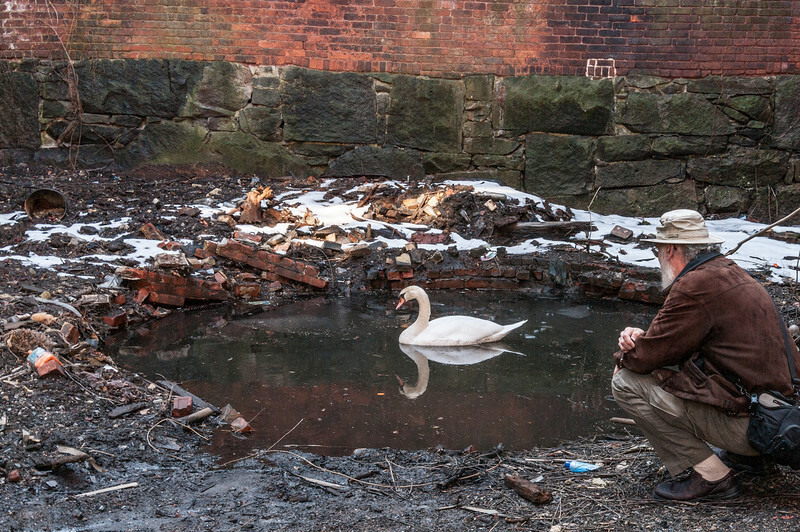 I really appreciated all three of your images, but your “Swan in Squalor” shot really struck a chord. This is a beautiful bird and both the ridiculously small pond and disgusting winter industrial/urban wasteland setting are jarring and creates strong emotional conflict. The only reason this is not higher in my top 3 is I feel your presence in the image very slightly acts to diffuse the impact and soften things – you look a kind caring person. To a small degree you are already acting as the sympathetic and helping observer – it is very slight, but I have to split hairs here. This looks and feels a distressing place and although primarily a photo of a smashed up car with graffiti on the bonnet, there is certainly sufficient background and context to let me also know, and importantly feel, that this is probably a pretty unpleasant place to be in. Your composition gives the image strength and impact, and I also admire your choice of post processing to add to the distressed grunge feel. A “lovely” stunning photo. Your Ecological disaster shot is also strong too. I surprised myself (and probably others) by choosing this, however for me this is a truly revolting and sad image with strong impact and is a reminder of how just a few people with no respect for the local environment (Places and Spaces) can create such disgusting scenes that others have to live with every day. I know Rats are natural creatures and could live there anyway, but they clearly add impact and imply filth and rubbish. I encounter “fly tipping” in the countryside around here and it never fails to sadden and I confess make me angry. It was well seen and well taken – great shot. To everyone who took part, thank you again. Over to you Paul for the next challenge. PS - If I ever set a challenge again it will be something a little more cheerful! Congrats to Paul, Tatiana, and Don - all eerie and interesting images... enjoyed seeing all the entries! Thank-you Alan, for running a very fine MC - you always go the extra mile and make it an interesting, challenging, and informative experience! Congratulations to Paul, Tatiana and Don for some really depressing, but wonderful photos! And Alan, congrats to you too for hosting an interesting, challenging and spirited Mini. Oh, and Alan - interestingly I never noticed the other house in the left background of the Murphy House! Thanks for pointing it out and I just may use a bit of PS to get rid of it! No worries Jo... Quite often I get "too close" to my photos to notice such things and I'm always grateful when someone points it out. Especially my pet hate - lens spots. I don't really think your background building is a big issue, but full of admiration if you think you can take it out - way above my pay grade! A great challenge Alan! Some very thoughtful analysis here as well. Congratulations to Paul, Tatiana and Don on some very interesting shots. Regarding the "paper mill" shot Alan, this was taken with an 80-400mm Nikkor cranked all the way to 400. I was actually out doing some bird wildlife pictures when I saw the mill off in the distance and thought about your challenge. There were some Black Vultures feasting on a fish carcass on the shoreline below my position in a shaded area and this guy darted by just as I snapped the shot. Decided to leave him in; however, as he was in the shade and much closer, everything I adjusted to decrease the haze and bring out some very distant detail on the paper mill was magnified on the nearby vulture. Hence, the very dark shaggy looking bird! I could have selected him out of the adjustments but ...hey I thought he looked scarier that way! Thanks again for a really interesting and enjoyable challenge. I have to post to these challenges early because my photos (especially digitized ones from the past) are quite inferior compared to most of the others posts. Congratulations to all of the (very deserving) winners. Since the fox shot got a bit more press than the other 2 (which I consider to be basic 'record' shots) I'll make a few more comments about it. I've no idea whether the term 'well crafted' is an accurate one ... but it certainly wasn't a 'snap' ... since I'm not built like 'Arnie', taking 'snaps' with a 500 f4 + 1dm3 isn't something I'd find particularly easy - even tho i do occasionally take HH shots with it. I saw it and decided to take pix of it - it was lying on the crown of a *very* busy road and initially tried getting a shot of just the fox,with no car in frame ...I did, but thought the image /story? would be stronger with a 'weapon'in frame too ...so messed around with settings to get the pic shown ... apart from some cropping to get rid of boring stuff, it's as taken. I was aware that I had limited time + being very aware of cars only a few feet away and that my presence, hunched over the cam on the pavement /sidewalk might create loss of attention on behalf of a driver, and I - together with others - might end up in a similar state as the fox. Alan, thank you for the third place win. Yes it would be stronger, in some respects without me in the image. What I found interesting is how placid the swan was to my proximity, that I hope was not a sign of its duress from the extremely bad quality of the water. This was a rain filled bottom of what was likely an industrial smoke stack in what I am sure is a brown field situation. It was also not a particularly open space, but an extreme cul-de-sac among old buildings. I was surprised to see it there at all. Ahhh ... Swans ... yes, have to deal with them on a regular basis at my local venue - photographically they offer both ends of the spectrum (imo) re shots. In decent light, doing something interesting, they can be fair game as a subject, in spite of being as common as ..., but,as an oof (big) white blob in the background, then, for me, they're a right pita . A fellow w/life snapper got a decent sequence of pix of swans defending themselves (and their young) at the above location. The media's version of the story was a load of bs - never let the truth get in the way of a good story,eh? 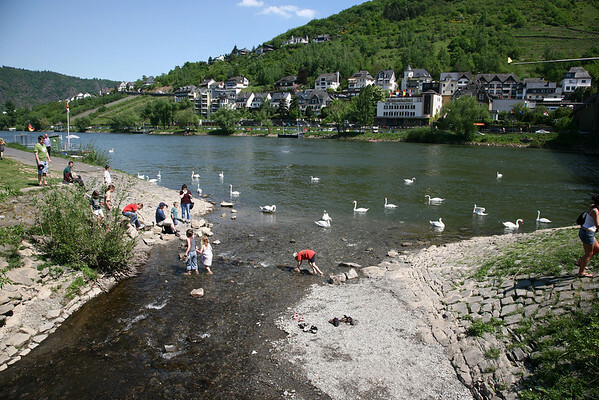 - correct version was that the swans were already in the water, minding their own business, dog, off lead, away from owner, sees swans, runs straight into water and attacks. Also, comments like this in the Mail's thread made both Simon (the 'tog) and myself smile. This is a snapshot which never fails to make me smile. 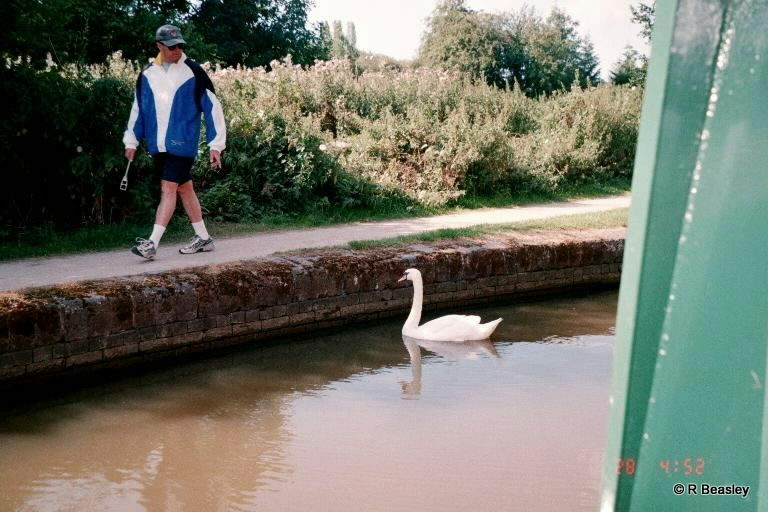 It is my son-in-law on a canal path going from one lock to another - he and the swan are assessing each other. There were some really distressing places.